it! Dexter is an American television drama series based on the novel Darkly Dreaming Dexter by Jeff Lindsay and adapted for television by Emmy Award-winning screenwriter James Manos, Jr. The show premiered on the premium cable network Showtime on October 1, 2006. Set and produced in Miami, the series centers on Dexter Morgan, a serial killer who works for the Miami Metro Police Department as a blood-pattern analyst. He kills other serial killers, people who "deserve it." 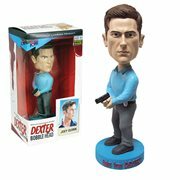 These bobble heads, action figures, mugs, and more from Dexter make killer gifts for persons of interest in your life, anytime you're in the mood. After all, they deserve it! 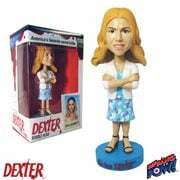 Dexter is an American television drama series based on the novel Darkly Dreaming Dexter by Jeff Lindsay and adapted for television by Emmy Award-winning screenwriter James Manos, Jr. The show premiered on the premium cable network Showtime on October 1, 2006. Set and produced in Miami, the series centers on Dexter Morgan, a serial killer who works for the Miami Metro Police Department as a blood-pattern analyst. He kills other serial killers, people who "deserve it." This article uses material from the Wikipedia article "Dexter (TV series)" and is licensed under the GNU Free Documentation License.